The gingerbread cookies in the break room, candy canes at the front desk, and paper snowflakes taped to the walls are the corporate signs of year’s end. This normally activates the work holiday season. This time ushers in a more ‘laxed environment and plenty of opportunities to get together outside of the conference room. Some companies have organizational-wide lunches where they can recap the year in a “fun” way by showing a slideshow of employee photos. Other places throw a holiday shindig where the liquor is plentiful and the impending shame is permanent. But when individual departments and smaller businesses want to celebrate, sometimes they’ll throw a holiday pot luck. It says “Hey, we’re festive but we have this pressing meeting at 2:00 and people will start taking their vacation time next week so we don’t have time to do anything else” but that never stopped anyone from signing up to bring in a dish. Now this sounds all well and good, but there are many reasons why you might want to avoid the company potluck. Pot lucks invoke test foods. Folks LOVE to try a new recipe when there is an opportunity for many people to test it. That is exactly what that pumpkin quinoa soup is. And if you try it, someone will be staring at you to see how you like it. Don’t let it taste bad either. Your microexpressions will be on full display for the whole team. But on the flip side, it could be good and potentially a new recipe to add to your cookbook. You don’t know how sanitary your coworkers really are. Yea, it really boils down to that. You don’t know if Valerie has a cat that likes to walk across her counters as she prepares her cranberry apricot stuffing. Or if Jeremy washes his hands after he leaves the men’s room. These people that you interact with daily could keep dirty kitchens and unhealthy lives. Do you really want to risk getting sick because Hannah with the constant pet dander really wants you to try her artichoke casserole? So unless you can really vouch for your coworkers, I would avoid going in on the pot luck. But if you must partake in the free lunch, get sample size portions and grab enough napkins. If you don’t like something you ate, cover the rest of the plate as you throw it away. You don’t want to be rude. You can also bring in a lunch that you can eat before the pot luck. That way, you’re too full to eat too much. There are polite ways around this, people. But not every pot luck is a bad one. 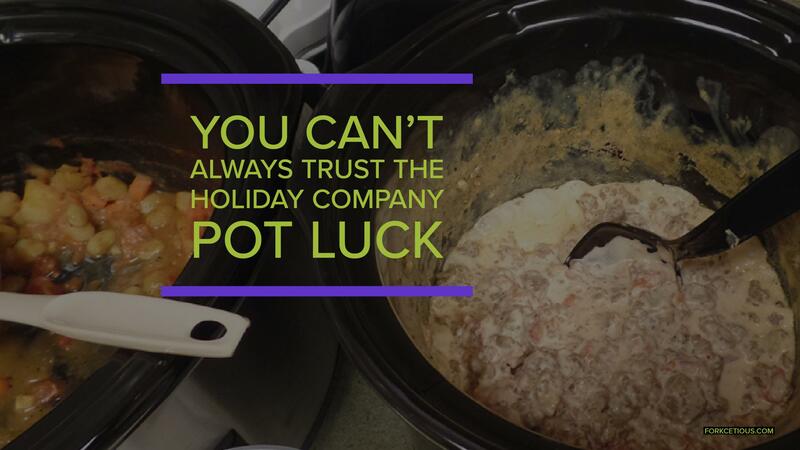 Do you have a work pot luck experience?